Rt. 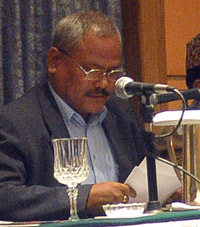 Honorable Deputy Prime Minister Mr. Bijay Kumar Gachhedar delivered the speech at the closing ceremony of Regional High-level Meeting on Rain Water Harvesting at Soaltee Hotel on June 30, 2009. The last few days have shown you all the good things of Nepal: its hospitality and friendly people, its culture and scenery, the rain and the sunshine. I am sure the experience has helped you to contemplate better the important issues of this High-level Meeting on Rainwater Harvesting: how we will be able to serve all in this country with safe, adequate water in their homes! Clearly rainwater can play an important role to enhance water scarcity for all, augment water available at home, both in rural and urban areas. Government will continue to work to provide safe water supply for all, through harnessing water resources available in streams, lakes and as ground water. But we must redouble our efforts to make better use of rain, snow and fog, to make sure that these valuable resources are used at least one time where they fall, before being discharged downstream. Our scientists and water practitioners have to undertake further studies to make rainwater harvesting feasible and so encourage its application in all spheres of society during the planning phase. I have mentioned earlier that the Government of Nepal is committed to promote rainwater harvesting and I urge regional countries to demonstrate similar commitment, in line with the declaration of the 15th SAARC summit. This High-level meeting has allowed us to work towards a regional network for sharing information, extending cooperation and gaining from the lessons we have learnt within the Region. The outcome of the Meeting will help our Government to assist the poorest and most vulnerable communities and households in promoting suitable and affordable rainwater solutions. Such practical outcomes are necessary to give us confidence for scaling up rainwater harvesting as an instrument in poverty alleviation and equitable development. Your deliberations and inputs of the last few days will prove invaluable for the Government of Nepal to further sharpen its water resources management policies and ensure appropriate mainstreaming of rainwater harvesting in our national water supply plans. Lastly, I would like to thank all delegates for coming to Nepal, and for my Nepali colleagues for providing their inputs to the success of the Meeting. I wish you all a good trip home and hope that you will be able to return to Nepal in a few years time to see how we will have progressed in applying rainwater harvesting.